Two month ago, I happened to pass by a Payless and decided to come in for a quick look around. Didn't really see anything interesting at the first floor, so I went up to the second floor, where shoes in my size were on sale. 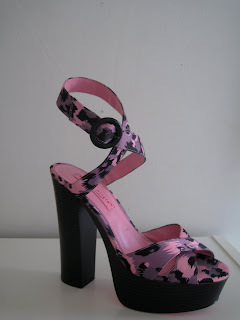 At the very bottom shelf of a display stand, nestled in its ratty shoebox, I saw this hot pink leopard spotted platform sandals by Alice and Olivia for Payless. The pink round sticker declared it was $5 but I couldn't believe my eyes, so I had to check with a salesperson to confirm. True enough, it was only five bucks! What a steal! I managed to make the strap stand properly, courtesy of skills I picked up from Louie Aguinaldo, product photographer extraordinaire! I've only ever bought one other pair of Alice and Olivia for Payless shoes, a black-and-white oxford style flat that's super comfy and that I wear nearly everyday. I don't know exactly how high these pink babies are but my guess is that they're five inches or more! So I don't think I'll be wearing them as much as my other pair, but for five dollars, I had to get them! Actually goes well with the pattern of our kitchen rug! I've only ever worn them once, with an oversized sailor-style sweater from H&M that I got for $8. A thirteen dollar outfit, how can you beat that?! super nice! makes me want to go to Payless and search if there's any pair left. $5!!! can't believe it! CRIS: Payless is hit or miss but I always like the Alice + Olivia ones. They're on sale now! Go na! TARA: Yeah, I saw the photos on spot.ph, they have cute styles ha! I haven't seen some of them here yet. OMG i love those shoes!!!! :) so girly and tough at the same time. What a lucky find! :) Inlove with your loose sweatshirt! I die of envy. Lol. If I may ask, how do you make the straps stand? And that nautical sweater+leopard print shoes combo is so unexpected and pretty!